Animals’ temperaments and travel logistics must be considered before packing up and heading out on a trip. In some cases, it may be better to leave your animal friends at home in the care of a trusted sitter, such as a relative, close friend, coworker, or neighbor. It’s best to stick with adults, since even well-intentioned youngsters can forget to come by when they are supposed to. When making reservations, let the airline know that you will be taking an animal with you. All airlines have restrictions and rules when it comes to flying with animals, and it’s best to understand and follow them in order to avoid problems. Be sure to use a sturdy, escape-proof carrier. Cats, in particular, can easily squeeze through small openings. Appropriate carriers are required by most airlines and are available through airlines or at pet-supply stores. Double-check the carrier’s clasp and consider padlocking it. The carrier must be adequately ventilated, with at least a ¾-inch rim around the sides so that the air holes won’t be covered if the cage is pressed against other boxes. Open the carrier several days before the trip and put blankets, toys, and treats inside so that your animal companion will view it as a cozy den. Do not put a leash inside the carrier because your animal could become tangled in it and suffocate. To avoid causing your animal to have an upset stomach, do not feed him or her for six to eight hours before the flight. Give your animal water immediately before placing him or her in the carrier. Only tranquilize animals if they are frantic and could hurt themselves trying to escape. In such cases, use a veterinarian-prescribed tranquilizer or a natural herbal remedy, but be sure to test it ahead of time to make sure that it will work for your animal. Make sure that your animal is wearing a collar and an identification tag. Take some temporary tags with you – one for each place that you will be staying (but be sure to keep the permanent tag on as well). Always book a nonstop flight. During transfers, animals are at an increased risk for accidents, trauma, and escape. If you must transfer, ask about the airline’s transfer policy. Most will not transfer animals to a connecting flight; you will need to retrieve them at the baggage claim area and recheck them. Avoid traveling in extreme temperatures. Most airlines now do not allow animals to fly in the cargo hold during hot summer months. Verify that the carrier’s baggage-claim tag shows the correct destination and is securely attached. Fill your animal’s water dish with ice cubes instead of water, which can easily spill. When you check in, ask the gate agent if you can speak to the ramp supervisor for your flight to offer that person any information that you feel may be useful about the handling of your animal. If the flight is delayed, inform the crew that an animal is on board and ask that the captain be informed. If the delay is lengthy, your animal must be removed from the plane until flight time. Insist on this. You are the only person who is going to protect your animal. Watch as your animal is loaded into the cargo area to ensure that he or she is on your plane. 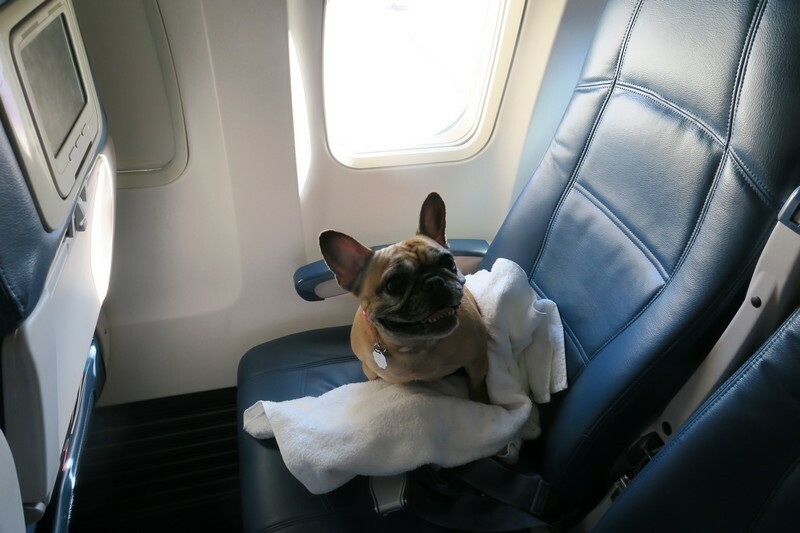 If you cannot watch, ask the flight attendant to phone the cargo area to make sure that your animal is on the plane before you board. When you reach your destination, retrieve your animal immediately. If your animal appears to be ill or injured, rush to a veterinarian. Carry water for rest stops. No-spill travel bowls are available in pet-supply stores and catalogs. For dogs who are prone to carsickness, consult your veterinarian for medication or try ginger capsules, available at health-food stores. Cats can turn into escape artists on the road, so keep them in sturdy, well-ventilated carriers that are big enough to allow them to stand up and turn around comfortably. Line the carrier with a towel and a small litter tray, and secure the carrier to the seat with a seat belt. Dogs are safest in a carrier or restrained with a canine “seat belt,” available from pet-supply stores and catalogs. Never carry dogs unrestrained in the bed of a pickup truck – all it takes is one abrupt stop to eject them from the vehicle. Don’t carry your animal in a box or carrier made of cardboard – it will provide almost no protection in an accident. Never open a car window or door when your cat or dog is unrestrained. Countless dogs and cats have been lost at tollbooths and rest stops this way. Stop to walk dogs often. DogFriendly.com provides information and links to dog-friendly lodging, parks, and beaches. TakeYourPet.com requires a membership but offers a free monthly e-newsletter that provides updates on animal-friendly lodgings and airlines. 1) Nicholas Read, “Pampered Pooches to Get First-Class Ride,” Vancouver Sun, 26 Nov. 2002. 2) Sarah Robertson, “Leave Fido Back Home? No Way!” The New York Times, 2 Apr. 2004. 3) Delta Air Lines, “Pet Travel Requirements & Restrictions,” accessed 22 Dec. 2010. 4) Sky Harbor International Airport, “Special Services,” accessed 22 Dec. 2010. 5) Scott Mayerowitz, “Traveling With Pets: Airlines With the Most Dog Deaths,” ABC News, 21 July 2010. 6) Amelia Glynn, “Senators Call for Change in Airline Pet Rules,” San Francisco Chronicle, 18 Aug. 2010. 7) TakeYourPet.com, “Member Benefits,” accessed 22 Dec. 2010. 8) Hannah Sampson, “Pet Set Finds Friendly Refuge,” Miami Herald, 9 Sep. 2004.